Oh, I’ve had baked jalapeño poppers a thousand times. (Well, maybe not a thousand, but l.o.t.s.) They are a popular, spicy appetizer here in San Antonio and I love them a.l.o.t. 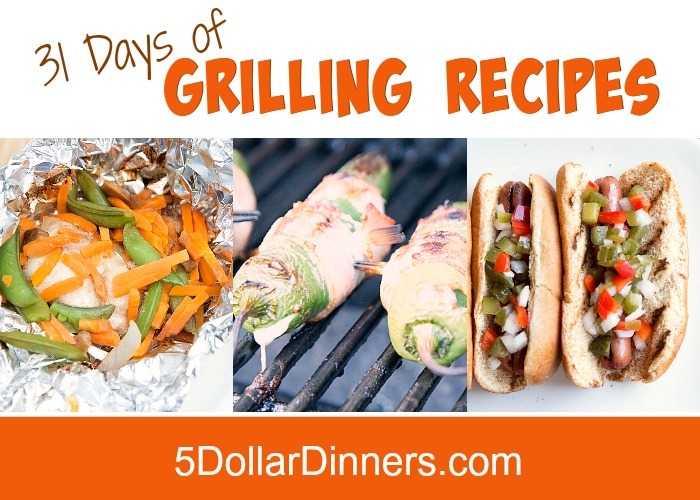 I decided to do a grilled version for our 31 Days of Grilled Recipes series. I discovered that the best way to make them on the grill without making a ginormous gooey-mess with the melty cheese, was to slice them open carefully down the side and dig out the super hot seeds and pith. Once they’ve all been cleaned out, you can sneak in some cheese and then wrap tightly with bacon. Some cheese might ooze out (see below! ), but for the most part, it will stay inside the peppers. I used a white quesadilla blend cheese for mine, but you could use Mexican blend cheese, or if you really want extra kick, try the Jalapeño Jack shredded cheese. Double the Jalapeño, double the spice! Slit open the jalapeño peppers along the side and open them up as if they were a coin purse. Using a paring knife or sharp edged spoon (like a grapefruit spoon), to pull out the seeds and white pith/ribs inside the peppers. Once the insides of the pepper are removed, add a few pinchfuls of cheese inside the pepper and close it shut. If a little cheese is sticking out, that’s ok.
Wrap halved piece of bacon around the pepper and add a toothpick to hold the bacon in place, and keep the pepper closed up. Repeat until all 12 peppers are prepared. 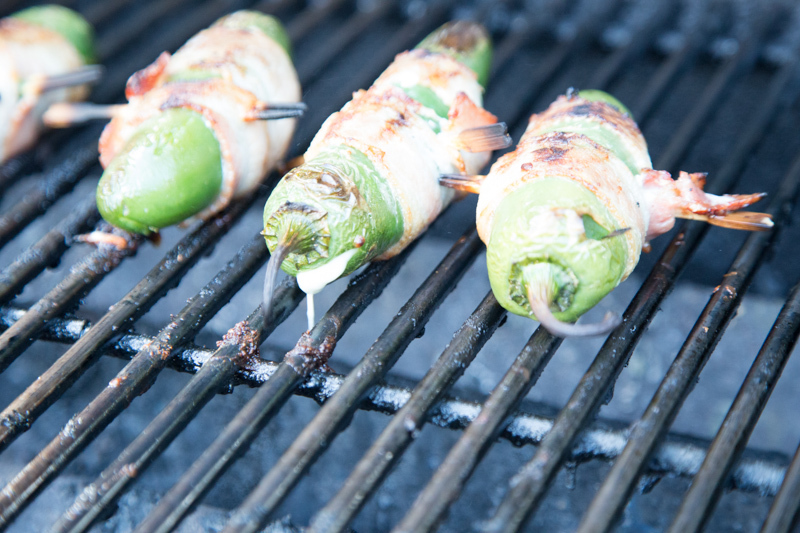 Once prepared, add to the grill and cook about 4 minutes, per side, rotating often. Grill until the bacon is cooked through, the peppers have softened some and the cheese is melted. 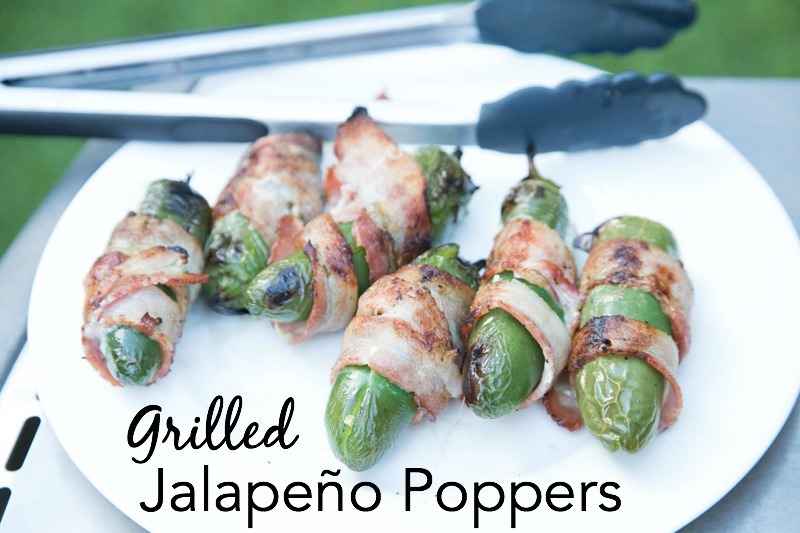 Serve Grilled Jalapeño Peppers as appetizers or side dish.